This guide is for the arcade game. For the MMORPG, see Cabal Online. Cabal is a 1988 arcade game by TAD Corporation (licensed to Fabtek for US production). 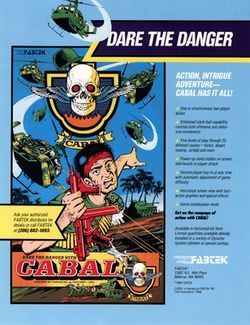 Cabal was followed in 1990 by Blood Bros., though the sequel had a western theme as opposed to Cabal's Vietnam-era theme. Cabal was ported to several home computers of the era, including the PC (under DOS), Commodore 64, ZX Spectrum, Atari ST and Amiga. It was also ported to the Nintendo Entertainment System console, which was ported by Milton Bradley. The quality of these ports varied based on the target system's capabilities. Two players could cooperatively play this game, simultaneously. The game's cabinet is a standard upright. Each player uses a trackball to move the player from side to side. On later board revisions, a joystick was installed instead with an optional sub-pcb for use with a trackball. The player assumes the role of an unnamed commando trying to destroy several enemy military bases. The player's character is seen from behind and initially starts behind a protective wall (the wall can get damaged by enemy fire). The player must use a limitless ammunition gun and a limited number of grenades to fend off enemy troops and damage the base. At the successful completion of a level, all the buildings onscreen collapse and the player progresses to the next stage. Boss fights, however, restart the battle if the player dies. This feature is criticized by many players but can be circumvented if two players play simultaneously and at least one stays alive at a given moment. Arcade machine with original trackball controls. Cover art for the early computer systems. Cover art fot the NES port. This page was last edited on 23 June 2012, at 05:11.